This summer there’s a world premiere musical by a New York writing team about the transgender mayor of Silverton, Oregon. What – you haven’t heard of it? Well, unless you’ve been up to the Intiman Theatre Festival in Seattle, you probably wouldn’t have. But this warm and deeply enjoyable show has some serious legs and with any luck should start to appear on stages around the country (and in Oregon) in the not too distant future. Company of STU FOR SILVERTON. Photo: Chris Bennion. 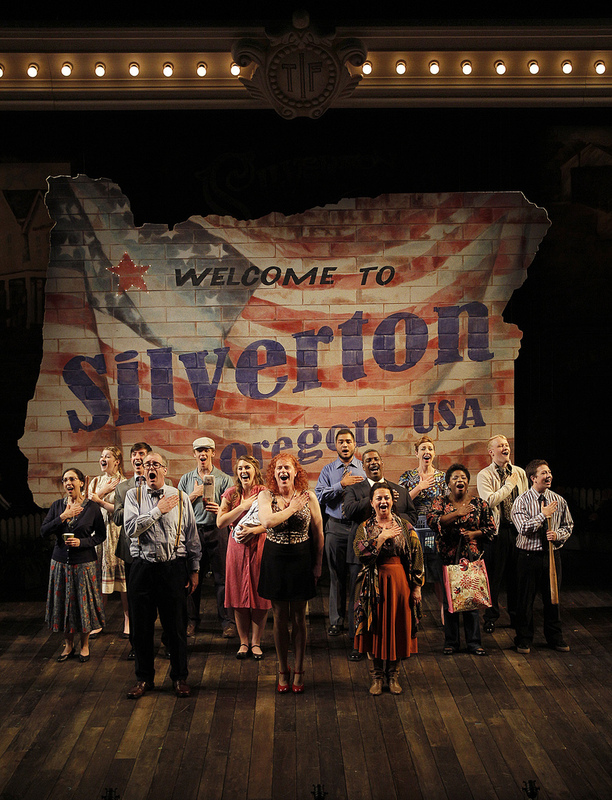 Part of Intiman’s Start Up Stagings program, STU FOR SILVERTON with a book by Peter Duchan and lyrics by Breedlove, is the strange but true tale of how lifelong Silverton, Oregon resident Stu Rasmussen narrowly became America’s first transgender mayor in 2008. Mark Anders (Stu Rasmussen) and Bobbi Kotula (Victoria) in STU FOR SILVERTON. Photo: Chris Bennion. The musical follows Rasmussen’s touching and completely individual quest for true self, culminating after his election with the inevitable visit by a bunch of out of town religious wingnuts from Kansas or wherever who descend on Silverton to condemn the mayor – only to find a huge turnout of local residents supporting their favorite local transgender pol. And then everyone basically lives happily ever after. Just by its very existence, this show is pretty interesting. A lot of America simply isn’t ready for the concept of transgender people, and to see a main character on a mainstream stage even talking about a lot of this stuff feels big. But the appeal of the show is that what might be seen as perplexing or threatening in the abstract becomes perfectly normal and even forgettable when experienced in the concrete form of a working class rural man. Once you hear Stu’s story, his journey makes perfect sense, and we can take a certain amount of pride that it happened here. This is not some sort of sensationalized freak show at all. In fact, if there’s a criticism of the piece, it’s that it’s almost a little too OUR TOWN ordinary. 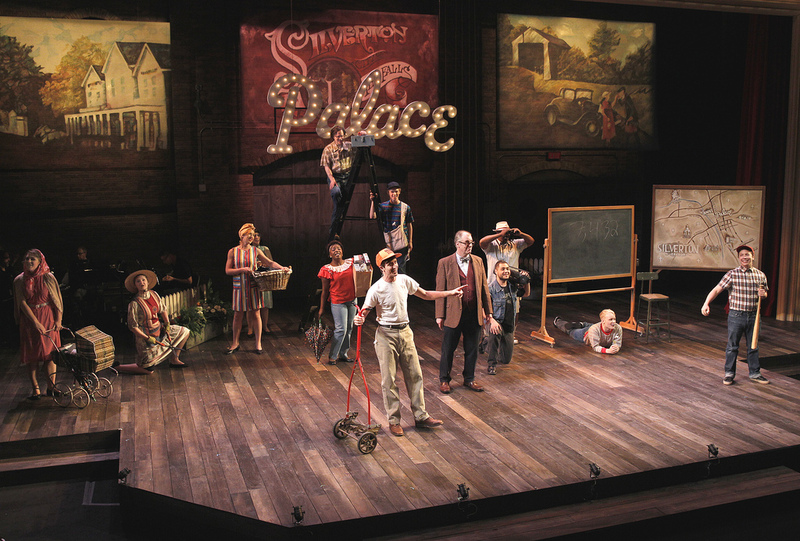 The story starts off knee deep in the feel and perky narration of the play in WAITING FOR GUFFMAN. Remember the story of Blaine? Eugene Levy would not be out of place here. That’s what the opening feels like, as chipper townspeople rush about and wish each other top of the morning in painfully earnest and happy normality. By the end, there’s a certain aw shucks quality to Stu’s identity. And maybe that’s the point. When the Kansans emerge at the end of the show with their “God Hates Fags” (but did they miss that Stu isn’t gay?) and “AIDS is a gift from God” signs, it is perhaps a measure of how far we have come that all you can do is laugh. The hate messages seem so ludicrously out of touch, they’re very hard to take seriously. Intiman has assembled a top flight acting company for this year’s festival, and it is non stop pleasure watching them work. 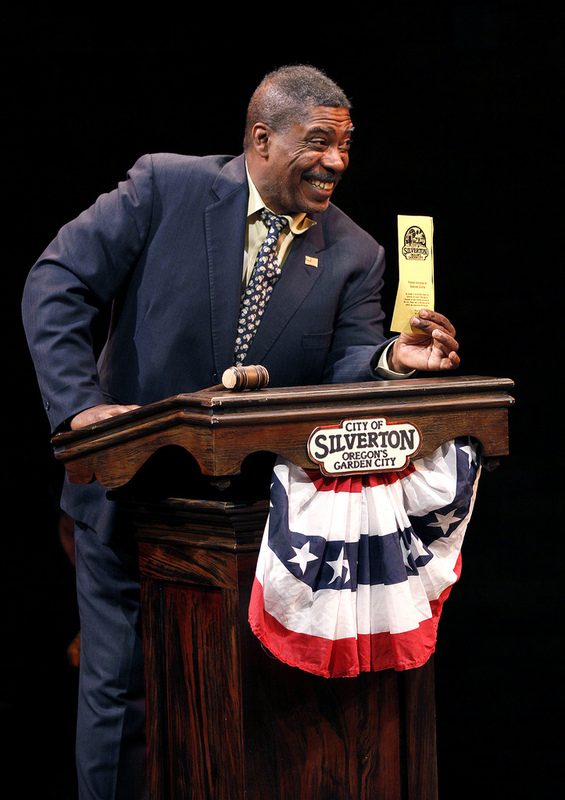 OSF star G. Valmont Thomas is on the scene as the pro corporate candidate Stu defeats in the election, and he’s marvelous. 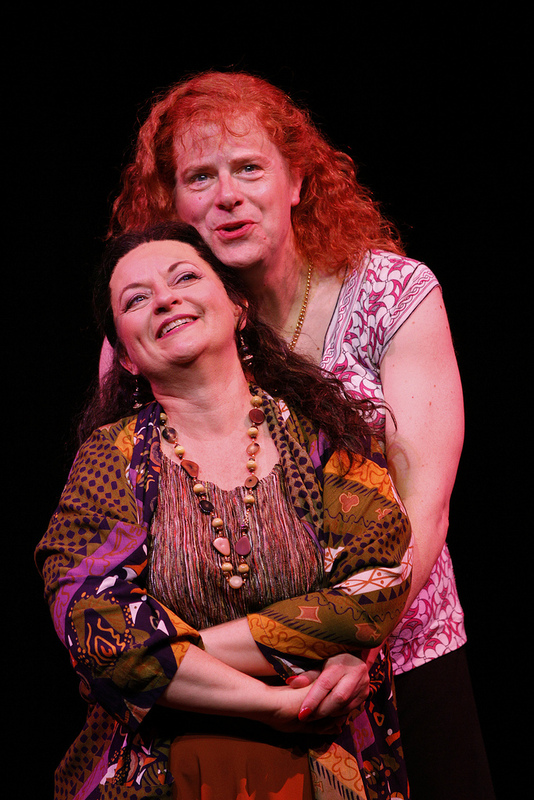 Mark Anders is fabulous as Stu, and Charles Leggett works well as the narrator. The always on G. Valmont Thomas (Jim Hodgett) in STU FOR SILVERTON. Photo: Chris Bennion. The good news here is really twofold: 1) There’s a dashing and witty new musical about the transgender mayor of a small Oregon town ; and 2) Intiman still has it. Survey says: Get thee to Seattle and see this show if you can.